As many of you may know, legend has it that Four Roses began with a love story between founder, Paul Jones, Jr., and his Southern belle. It is said that he sent a proposal to her, and she replied that if her answer were “Yes,” she would wear a corsage of four red roses on her gown to the upcoming grand ball. He later named his Bourbon “Four Roses” as a symbol of his devout passion for the lovely belle, a passion he thereafter transferred to making his beloved Four Roses Bourbon. 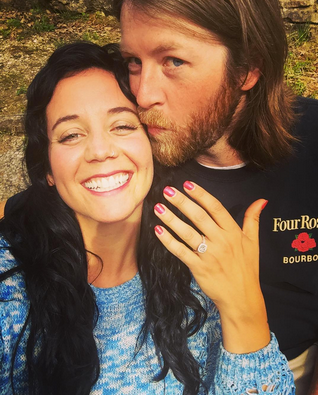 Our Bourbon has been made with that same passion since 1888 and that tradition lives on, as our newly-engaged friends, Olivia and Michael, were brought together over Four Roses Bourbon. After Olivia (@oliviakeaggy) shared their Four Roses proposal with us on Instagram, we took some time to learn more about their story. How did your love story with Four Roses Bourbon, and each other, begin? Both from Nashville, Tennessee, we were set up on a blind date by a mutual friend in July 2016. We quickly came to realize that not only did we have a special connection, we had something very important in common—Four Roses Bourbon was our number one drink of choice. Actually, that’s all we drank when we first met and we’ve always made sure to have a bottle at the house since then. How did Michael propose? Were you surprised? He took me to Cumberland State Park where he had rented this beautiful rustic cabin that sat beside these gorgeous waterfalls. We were in the middle of drinking Bourbon (Four Roses, of course) and cooking dinner when he pulled me outside by the water and started to tell me all the reasons he loved me and why he wanted to be with me forever. That’s when I knew he was about to propose! Then he got down on one knee. We continued to drink Four Roses on the rocks the rest of the evening while we dined, danced, cried and laughed. We both found it absolutely hilarious that we happened to be wearing our matching Four Roses Bourbon t-shirts, and the rest is history! What is your favorite way to drink Four Roses Bourbon? Our favorite way to drink Four Roses is on the rocks. We learned that on our first date. 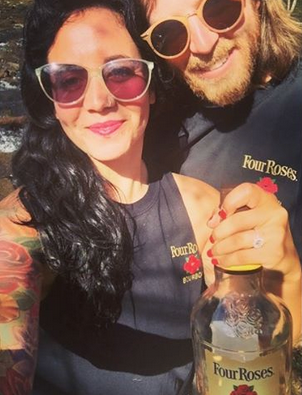 We will be married in Nashville on April 27, 2018 and plan to have a signature Four Roses Bourbon cocktail at the reception. We both have big families and include it in every family function. What’s better than 250 people celebrating and drinking Four Roses together?! It is the spirit that brought us together, after all.